Unfortunately, most people deal with some form of bullying throughout their life. One of the worst things about bullying, besides how common it is, is that it can happen in so many forms- verbal, physical and emotional- by so many different people- family, peers and workmates- and in so many ways- passively, actively and technologically. While there are many ways that people are expected to deal with the issue, more often than not, there is no clear resolution to the problem. The situation can be further complicated when there is little to no support network for the victim. These people are then expected to cope with the onslaught of abuse and deal with it in the only way that they can, often leading to tragic results. While the bullying situations in Rebecca Starford’s memoir, Bad Behaviour, don’t get to quite that point, there are still some rather uncomfortable and painful forms of abuse detailed within the pages. Reminiscing on her year, living at a prestigious Victorian boarding school (which is never named for privacy reasons but which most people are aware of, considering a British prince once attended), Starford details the horrific bullying tactics that some girls stooped to in order to maintain their popularity. As both a victim and a perpetrator, Starford saw both sides of the bullying issue, and has written this book to remind herself, not only about her experiences during Year 9, but of the residual effects that the year had on her, later on in life. Living at a rural and relatively primitive boarding campus, the students of this particular school are cut off from most forms of technology, instead having to hand write letters to their families. They also have to chop their own firewood, go on weekly overnight hikes and camps, and train for a difficult cross-country marathon event that takes place at the end of the year. As well as this, they are expected to attend their classes, take extra-curricular activities and respect the school staff and their peers. This year in the bush is meant to build resilience, confidence and independence, yet for many students, it can be a tough slog, especially when the dorms have limited supervision and there are students who like to play power games. Starford was hoping that her year would be one that she wouldn’t forget, and she wasn’t disappointed in that. She wouldn’t easily forget the events that shaped her adult life and left her questioning her friendships. She wouldn’t easily forget the alternating shames and joys that came with living in a house of sixteen unruly and/or vulnerable teenage girls, or the isolation of being away from her family. While she managed to push some of her darker memories to the back of her mind, a visit to the school during her adult years helped to resurface those memories, and make her re-evaluate her behaviour while a teenager at the school. In these memoirs, she has revisited these memories, and intersperses the events of the time with similar, more recent events in her adult life. While Starford has some negative stories to tell about her year in boarding school, she also recounts quite a few positive ones, showing that this is not a school-bashing exercise but rather a painfully honest narration of her experience in a private school-based boarding situation. As both a bully, and later a victim, she is not afraid to put herself or her bad behaviour in the spotlight, despite the bad impression of her that it may leave on the reader. But readers are also likely to sympathise with her and her experiences, particularly if they, too, have experienced a similar sort of peer pressure or need for acceptance. 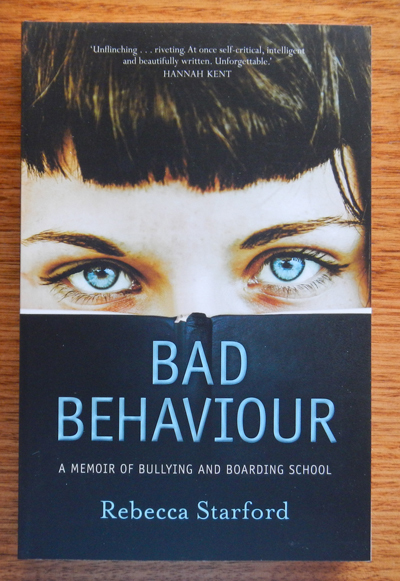 This is an interesting view into the life of a boarder and is essential reading for anyone who wants to study the effects that bullying can have later on in life.